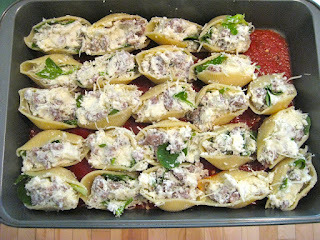 One of my all-time favorite pasta dishes to make are jumbo stuffed pasta shells. When I make these, I like to go all out. I typically stuff the shells with 3 types of cheese, italian sausage and spinach. Basically you get a mouthful of yumminess. I started making this dish in high school when my sister brought home a cookbook from her church in Nashville. As I was leafing through it, this recipe caught my eye and it was history from there. Yes, there is a bit of work (and getting your hands messy) required to create this delicious masterpiece, but it's SO worth it! In a medium skillet, cook the Italian sausage. Drain the sausage (lots of grease will seep out from the meat as you cook) and set it aside to cool. 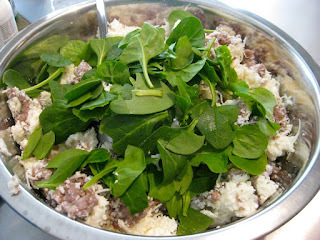 You need to make sure the meat is completely cooled before mixing it with the cheeses later so the mixture won't melt. If I'm in a hurry, I'll stick it in the fridge until I'm ready to use it. Preheat oven to 425 degrees F. In a large bowl, combine all three cheeses, eggs, black pepper, spinach, and sausage. Be sure to leave enough mozzarella and parmesan to sprinkle on top of your dish later. This is the part where your hands get messy. Mixing with your hands is the easiest way to get everything combined well. (PLEASE WASH YOUR HANDS WITH WARM WATER & SOAP BEFOREHAND!! Well, I hope you wash your hands well before cooking anything...) If you are not ready to stuff the shells yet, you can stick the mixture in the fridge. Take a medium/large baking dish and pour enough pasta sauce to cover the bottom of the dish. 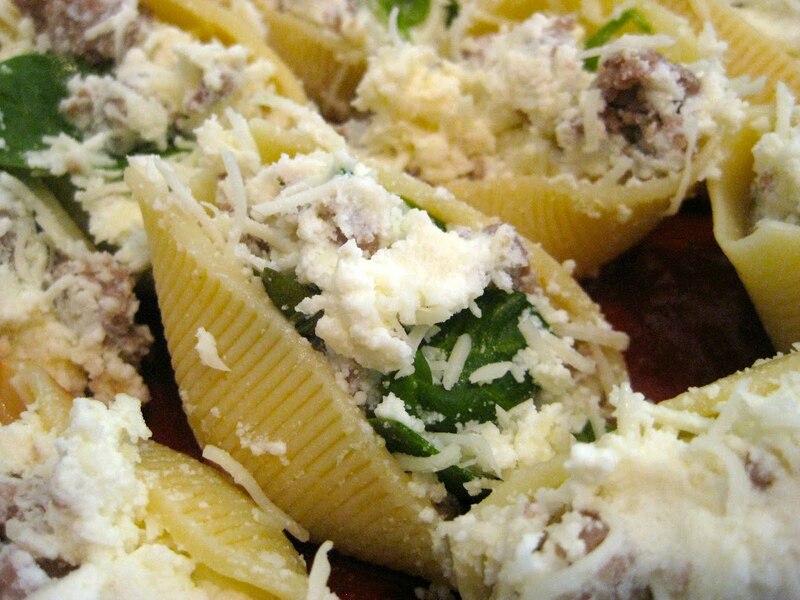 Then, using a spoon, scoop the cheese mixture into each shell and set them in the dish. If you run out of room, you can cover the first layer with more sauce and begin a second layer. Once all the shells are filled, use the rest of your pasta sauce to cover the shells. Make sure they are covered well so that they do not harden when baking. Stick the shells in the oven for 10 minutes (or 20 minutes if your cheese mixture was in the fridge). Take them out and sprinkle the remaining cheese on top and bake for 5 more minutes. I've only had the mini shells! these look so yummy though! definitely something different for me but i would love to try it one day! thanks for sharing!